THE BARON SOLUTION™ Minute is a weekly audio vignette offering invaluable business, personal finance, and success information from international best-selling author and four-time award-winning lecturer William R. Patterson. 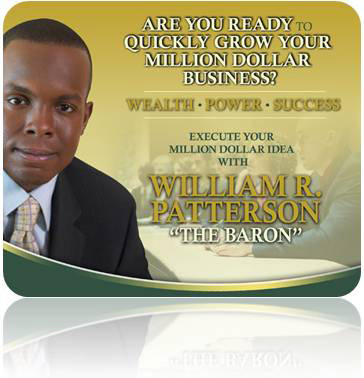 THE BARON SOLUTION™ Minute is a weekly audio vignette offering invaluable business, personal finance, and success information from best-selling author and award-winning lecturer William R. Patterson. Millions of Americans are struggling to pay their credit card debts which often carry interest rates as high as 25-30%. While debt management plans offered through credit counselors are not for everyone, they can certainly be a life-saving option for many individuals struggling with huge debts or on the brink of bankruptcy. Here are 5 BARON tips for finding and evaluating credit counseling services offering debt management plans that can dramatically lower your interest rates and monthly payments, saving you thousands of dollars. In an age of increased terrorism, natural disasters, and identity theft, it is more important than ever to think about financial and business disaster recovery. Here are 7 quick BARON tips that can save you and your family valuable time and money in the event of an emergency. Credit should always be used responsibly, not as a way of living beyond your means. Here are 5 BARON tips to better manage your credit and raise your score with lenders. According to energy analysts, gas prices are likely to set record highs this summer. Here are 10 easy BARON tips that can save you as much as to 20% at the pump. Tens-of-thousands of people around the world know that THE BARON SOLUTION is a workable strategy for moving from poverty to wealth. Here are seven simple ways that nearly anyone can find an additional $600-$5,000 a year in their family budget to invest without changing their current lifestyle. Recently, we have seen unemployment highs and a number of signs of weakness in the economy. With many unpredictable factors looming including changes in government, rising oil prices, conflict abroad, stock market volatility, and a meltdown in the housing market, it is more important than ever that individuals take important steps to be prepared in the event of an unexpected job loss or recession. In order to build significant wealth, it is important to move away from a one-to-one relationship with money, where you trade an hour of your time for a specific dollar amount. Instead, dramatically increase your leverage by mastering the ability to create a product or service once that you can sell infinitely. Due to lack of knowledge, millions of Americans end up being the victims of high interest rate, predatory loan products. While most companies are not considered predatory lenders, it is important that you have basic knowledge of financial loan terms to be able to discern the difference. Here are seven important loan terms that predatory lenders often use to increase your risk of default or the amount you owe. In March and April of every year, millions of Americans will be filing their taxes and receiving sizeable refunds. This year tax refunds are up, totaling over $2,500 on average. Here are 7 smart ways to increase your cash flow, build up your cash reserve, and invest for the future using your tax refund. Imagine your life if you didn’t know airplanes, cars, computers, telephones or email existed. How much time and money would you waste using inefficient tools and methods? How many opportunities would you miss? This is the reality for tens of millions of Americans using outdated models, tools, and strategies for financial success. Most people find it difficult to make money in a rising market, much less in a down market. However, there are those among us who understand that playing the downside of a market is a vital part of building wealth. Whether you are protecting your long-term investment portfolio from a catastrophic loss or looking for ways to dramatically accelerate your path to financial freedom, downside investing is a vital skill to learn. In our work with thousands of people across the U.S. and abroad, we have found that there are seven reasons that most people struggle financially and contrary to popular belief, their struggle has nothing to do with money. Examines the wealth-building lessons from Black industry Barons whose vision, decisive action, and perseverance have forever changed the world of business. When it comes to finance and investing, there are some general rules for couples to follow to achieve stability, happiness, and long-term success. These rules fall into four areas: saving and investing for the future, day-to-day management, emergency and estate planning, and emotional support. Title: What Makes a Great Investment Opportunity? Whether it's a hot stock tip from a friend, deciding whether or not to invest in the company that you work for, or choosing between a group of investment prospects, evaluating them against these five criteria you will help you achieve higher returns with much less risk. When making purchases and investments, it is always important to not only think about the present value of your money, but also the future value of your money. In its simplest state, financial success begins and ends with four questions: (1) Where am I now? (2) Where do I want to be? (3) How do I get there? (4) How can I tell if my plan is working? Millions of Americans all across the country struggle with the issue of debt. Like all problems, debt will dangerously compound if we ignore it, so we must confront it head on to positively change the condition of our lives. When it comes to real estate, some would have you believe myths such as: (1) you can’t invest in real estate with limited cash or poor credit; (2) there are no bargains left in the market; (3) certain strategies won’t work in a particular area. The Baron Insight says, "There is no shortage of opportunity only a shortage of insight." There are plenty of opportunities to finance deals and find great properties available everyday. Most people struggle financially because they attempt to build wealth with a linear approach—using one investment strategy, one portfolio, and one stream of income. To build significant wealth in a way that brings you greater freedom with each dollar made, you have to learn to manage multiple investment strategies, multiples portfolios, and multiple streams of income. It is important to learn disciplined strategies of sound money management, investing, and business administration. The more you learn about these areas, the more confident you will be in selecting advisors, making investments, and handling your financial affairs. When it comes to business and investing, one of the most important things you can do is to have a clearly defined exit strategy before you begin—before you invest a dollar, before you enter a relationship, and before you start a business. Let’s examine how the three major financial statements, the income statement, balance sheet, and cash flow statement can be used to analyze the companies of two individuals, Bob "The Baron" and Steve "The Struggler," each of which has asked us to make an investment in his company. Imagine what your life would be like if you were unable to read or do basic math. When it comes to your finances, knowing how to interpret financial statements is as critical to your life as knowing how to read. Each action is the brick that builds our pyramid of freedom or our prison of struggle. Ultimately, it is about learning to use leverage and managing the risk associated with it. Learn how to create value using the three major vehicles for building wealth: real estate investing, the stock market, and owning your own business. Take these five important actions to dramatically improve your life and learn to create and attract boundless opportunities. No matter where you are, you can begin to turn your life around or dramatically improve your financial situation using THE BARON SOLUTION 5-Step Action Plan for Building Wealth. According to the SBA nearly 60% of small businesses fail in the first 4 years. To beat these odds, leverage THE BARON SOLUTION four keys to a building a successful business.